Researchers at Drexel University have developed a method to spray on antennas that outperform traditional metal antennas, opening the door to faster and easier IoT deployments. In what could be a giant leap for Internet of Things (IoT) form factors, scientists say they have invented a spray-on antenna. And the bug-spray-like application will outperform traditional metal antennas, they claim. If it indeed does outperform traditional antennas, the clear, ink-like radiators will transform physical mediums used in constructing networks. Flexible substrates, windows, or data center walls even could be made into antennas, which would then drastically alter the data-collecting landscape. “Installing an antenna [could be] as easy as applying some bug spray,” an article on Drexel University’s website says. The way the concept works is that titanium carbide compounds are dissolved in water to make the paint. The compound derives from a type of materials-science product called MXene (invented at Drexel in 2011 and pronounced "maksens"), which is basically an inorganic, super-thin material only a few atoms thick that combines conductive metal with water-dissolving characteristics. The material in the lab tests is then actually sprayed onto the object using a craft-style airbrush. When the water evaporates, the antenna remains. “The exceptional conductivity of the material enables it to transmit and direct radio waves, even when it’s applied in a very thin coating.” It’s extremely conductive, the researchers say. Slimming, such as the tens-of-nanometers to microns thick that the group have obtained with the transparent antennas, would provide IoT weight reduction, too. That’s crucial for some tracking sensors, such as those used in shipping. The lightness could also have a knock-on effect in reducing sensor power consumption — the lighter a drone is, for example, the less power it needs from the same battery size and, thus, the more longevity it has in the air. The group say an optimum thickness of one-tenth the thickness of paper outperforms other nano-materials in testing, such as graphene. Further, the flexibility could allow integration with significantly more objects than is possible with incumbent aluminum, copper, and other metals used to make traditional aerials. “Glass to yarn and skin” are all surfaces that will be tested. And indeed antennas aren’t going away anytime soon. A 5G radio engineer told me recently, unrelated to the spray-on antenna project, that the number of radios needed per person in the future could turn out to be about 1,000. And one is, in fact, seeing some upcoming 5G IoT wireless technology using MIMO antenna technology, with 64 antennas in one radio. 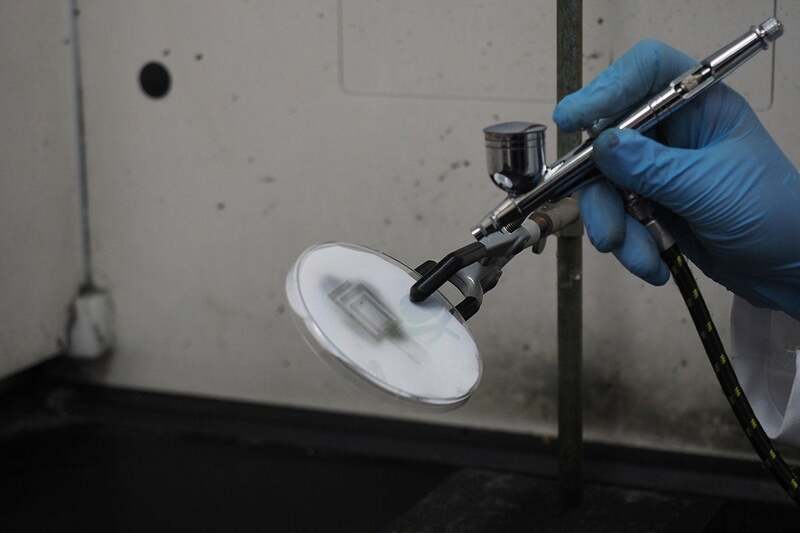 “Spray-on antennas could be the tech connector of the future,” Drexel says. “Antennas could be airbrush-sprayed almost anywhere, by almost anyone, for nearly any purpose,” some of the researchers write in a related article published in The Conversation.